Want to be notified of new releases in jules2689/extended_bundler-errors? Extended Bundler Errors is a bundler plugin that makes gem installation errors more actionable, educative, and all around easier to understand. Previously when gems fail, bundler would simply tell you it failed and give you any output from the gem itself. This often includes C traces from native extensions. These are hard to follow, particularly for people new to Ruby, because it requires you to understand the underlying system, programs in use (Imagemagick, SSL libraries, parsers, etc), and the output is simply verbose. This gem instead will try to match the output of the gem to a series of handlers (see lib/extended_bundler/handlers for a list). Each handler is specific to a gem, an matches one of many potential output. Once matched, we replace the error with something that explains the known problem, how to fix it, and (if possible) include a link to the original output. 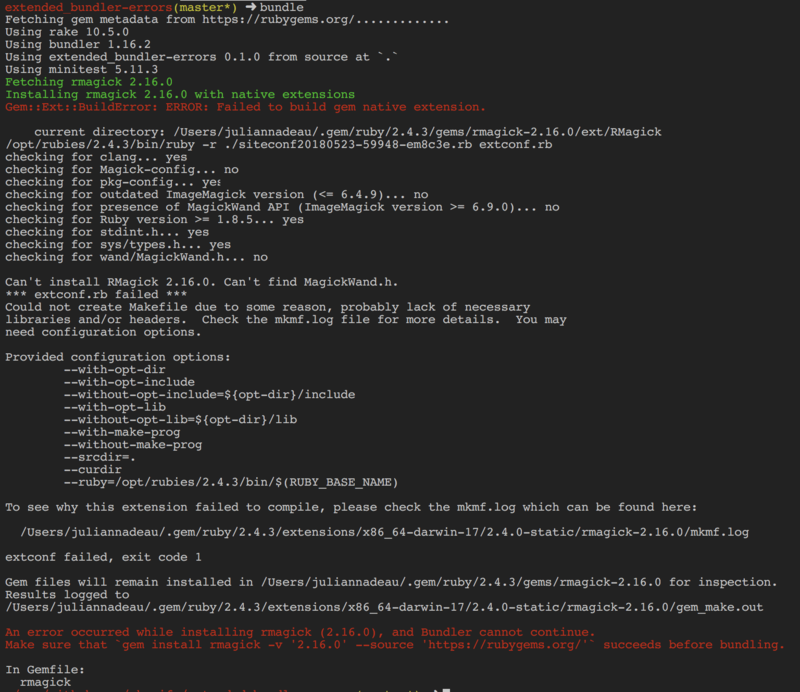 Before when RMagick fails to install, you got a verbose log. After when it fails to install you get a specific, actionable reason and step-by-step guide on how to handle it. It is recommended to install from git and work directly in a bundle install run. Errors will happen so we want to make sure we can respond to them properly. Instead of finding an answer on StackOverflow or somewhere ese, let's make sure everyone in the future can get a better error message directly in their terminal during the install. Create a file under lib/extended_bundler/handlers named "GEM_NAME.yml"
Note, this is an array of "matchers". We will try each one iteratively against the GEM_NAME until the first one matches. So if you have multiple handlers for a single gem, just continue expanding the yaml file. Bug reports and pull requests are welcome on GitHub at https://github.com/jules2689/extended_bundler-errors. This project is intended to be a safe, welcoming space for collaboration, and contributors are expected to adhere to the Contributor Covenant code of conduct. Everyone interacting in the ExtendedBundler::Errors project’s codebases, issue trackers, chat rooms and mailing lists is expected to follow the code of conduct.